One great thing about R is that has a wide diversity of packages written by many different people of many different viewpoints on how software should be designed. However, this does tend to bite us periodically. That's a lot of minutia to remember. I did a quick and dirty census of all the classification models used by caret to quantify the variability in this particular syntax. The train utilizes 64 different models that can produce class probabilities. Of these, many were from the same package. For example, both nnet and multinom are in the nnet package and probably should not count twice since the latter is a wrapper for the former. As another example, the RWeka packages has at least six functions that all use probability as the value for type. The most frequent situation is no type value at all. For example, the lda package automatically generated predicted classes and posterior probabilities without requiring the user to specify anything. There were a handful of cases where the class did not have a predict method to generate class probabilities (e.g. party and pamr) and these also counted as "none". For those of us that use R to create predictive models on a day-to-day basis, this is a lot of detail to remember (especially if we want to try different models). This is one of the reasons I created caret; it has a unified interface to models that eliminates the need to remember the name of the function, the value of type and any other arguments. In case you are wondering, I chose `type = "prob"'. 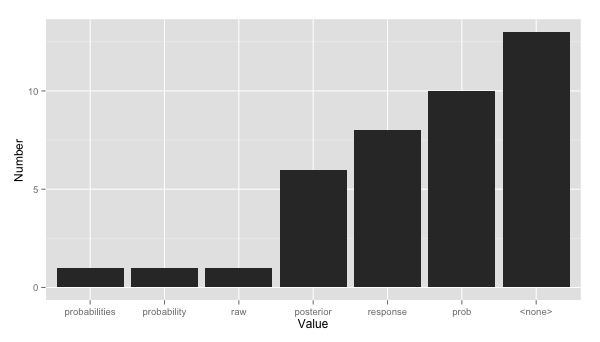 Tagged with R, Class Probabilities, caret. June 13, 2013 by Max Kuhn.